Today is a specialized 5 Find Friday. My kids always love it when we get something that comes in a huge box. It means playtime. 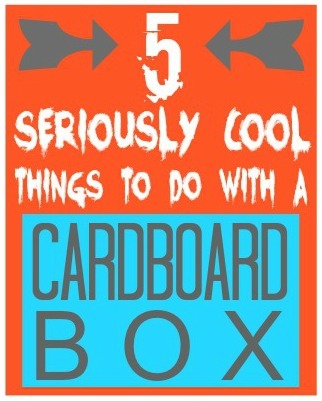 Well, here are a few different ways to create something seriously fun from your next cardboard box. 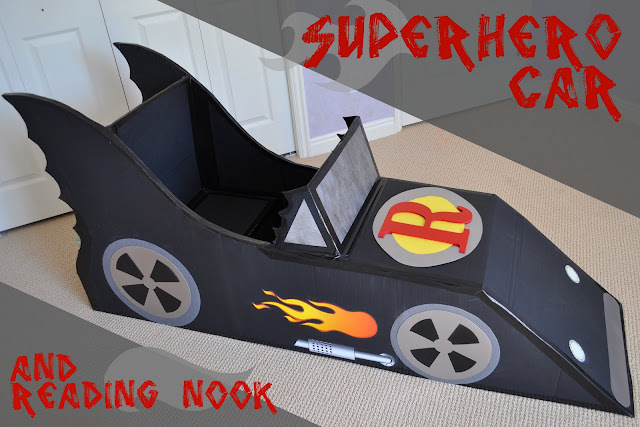 2) This superhero car and reading nook stuck around our house for almost two and a half years. It does take more than one box. However, you can usually find leftover boxes for free. The boys used it a lot. We finally parted with it a couple of months ago as the stickers began to fall off. Find more info about it HERE. 3) A Gas Pump. I wish I'd thought of this one. It's from Parenting Magazine (January 2011). My boys would love to ride their bikes around and then "fill up." They do that with our leaf blower in the garage when they're out riding bikes. This is even better. 4) Furniture. 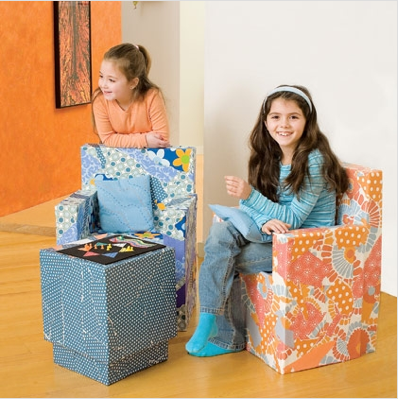 Child-sized furniture is really expensive, but so cute. Why not make your own? Find out how HERE on Spoonful. 5) Light It Up. 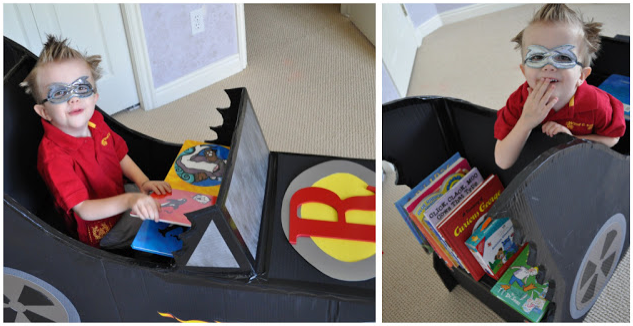 We did this last year to add a little extra fun to our cardboard box playhouse. The original idea came from HERE. 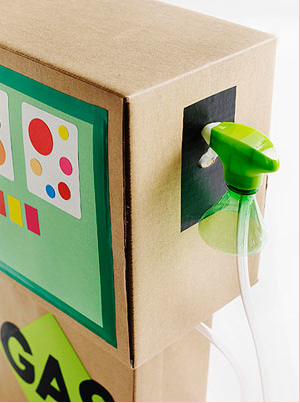 All these projects kind of make me want to go out and find a giant box. I can't wait to try the slide and I think it'd be fun to make some child-sized chairs for the boys' rooms. And that's all for today. Thanks for dropping by. I love that stair slide! But how do you get UP the stairs? When I was a little girl ~ my sister and i would actually get into big boxes and slide down the steps..My mom would be in the basement washing clothes and when she heard us go down the stairs screaming our little heads off she would come running pale male up those stairs to see what all the racket was, she was not happy . We had fun ~! I like this a lot~! Flattening out the boxes makes this slide looks safer.. I also like the lights poked into the box to give light inside...what a great idea to do with boxes...Thanks..~! My mom would put on the William Tell Overture and all of us kids, and my mom, would get on our pillows and ride them down the stairs. No one ever got hurt and it's the best memories of my childhood. I had an awesome mom. I love these ideas! I think a cardboard gas station is in our summer future... Here's a cardboard coffee shop I made for our kids, if you are interested. They really play with it a lot. Thanks for sharing! I can't believe I missed that post with the lights stuck through the side of the box! What a brilliant idea (ha)! These are all great ideas. I think I still have some large moving boxes tucked away from a few years ago. I saved some for projects just like these and now that cabin fever has hit up here in Minnesota, it might be time to bust them out! :) We've done the box with lights in it, I actually just posted about it the other day. I love Play at home mom. Amazing what you can do with cardboard! Here in New Zealand they're building a real cathedral out of cardboard after an earthquake 2 years ago destroyed the beautiful Christchurch Cathedral. Hard to comprehend, but it's really happening. Google 'cardboard cathedral'. These are all awesome ideas! I just posted about the cardboard box that has lived in our dining room for the last month. I think we may have to try the bat car next! (As fun as the slide looks my boys are still a little small. Maybe next winter.) Thanks for the round-up.